Benjamin Rose Institute on Aging - Home and community-based services for older adults to keep them independent in the community. Friedman Law LLC - Susan Friedman will be available to discuss special needs planning including special needs trusts. NAMI Greater Cleveland - The National Alliance on Mental Illness Greater Cleveland is dedicated to empowering persons affected by mental illness and their family members by providing them with support, education, referral and advocacy. PLAN of NE Ohio - Will share social and recreational programming available. Support for caregivers and the loved ones with mental illness that they care for will be the theme for two fairs presented by Courage to Caregivers. The second caregiver fair – Thursday, May 23 from 6:30 p.m. to 8:30 p.m. – will focus on the caregivers’ support for their loved one and will have information and demonstrations of practices such as behavioral healthcare, art and music therapy and more. 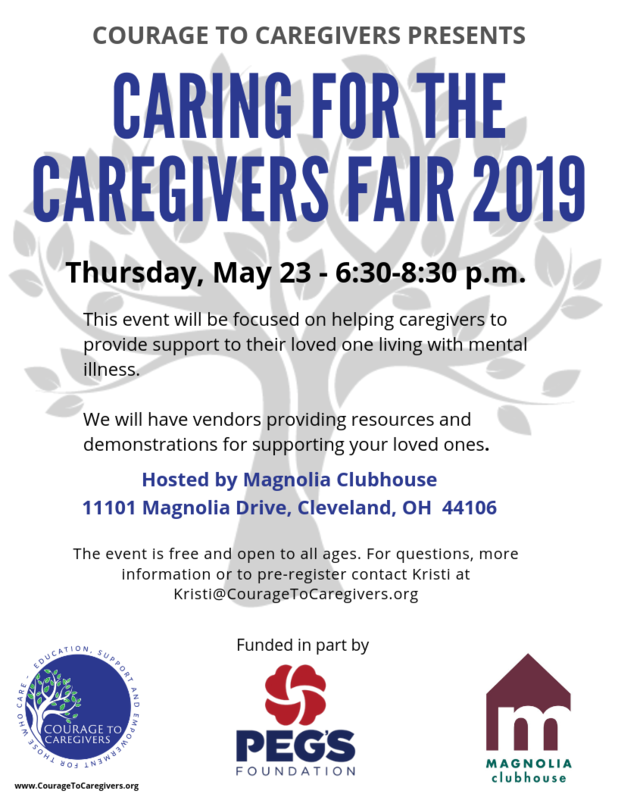 Both events will be hosted at Magnolia Clubhouse, 11101 Magnolia Drive, Cleveland, a community partner of Courage to Caregivers. Caring for the Caregivers fairs are part of the Courage to Caregivers One-to-One Caregiver Support program. The program is funded in part by Peg’s Foundation, an organization focused on improving the lives of people with serious mental illness by investing in innovative projects in Northeast Ohio.